Wisconsin’s state abortion report for 2017 shows that abortions in the state increased from the previous year as a result of a new abortion center opening in 2017. State pro-life groups predict that the increase could continue in 2018. *Resident abortions only. Information on Planned Parenthood’s Wisconsin market share is not publicly available. In 2017, there were 5,818 abortions reported in Wisconsin, a drop of 66 percent from 1987, the year Wisconsin’s case-based abortion reporting system went into effect. Since 2016, when 5,612 abortions were reported, Wisconsin abortions have increased by four percent. Wisconsin Right to Life attributes the increase to a new Planned Parenthood center that opened in 2017. Information on chemical abortion is reported for residents only. 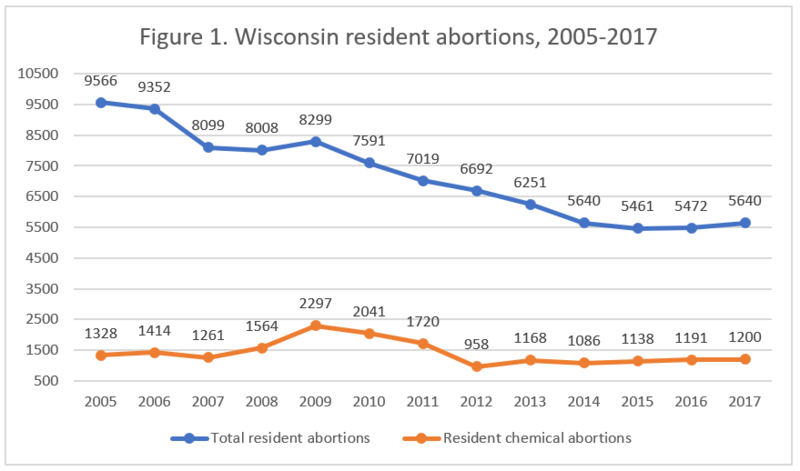 From 2016, total resident abortions performed in Wisconsin increased by three percent, while resident chemical abortions increased by less than one percent (Fig. 1). Chemical abortions have risen by 141 percent since 2001, the first full year after the U.S. Food and Drug Administration approved the use of Mifeprex to induce abortions. In 2017, chemical abortions made up 21 percent of all resident abortions. 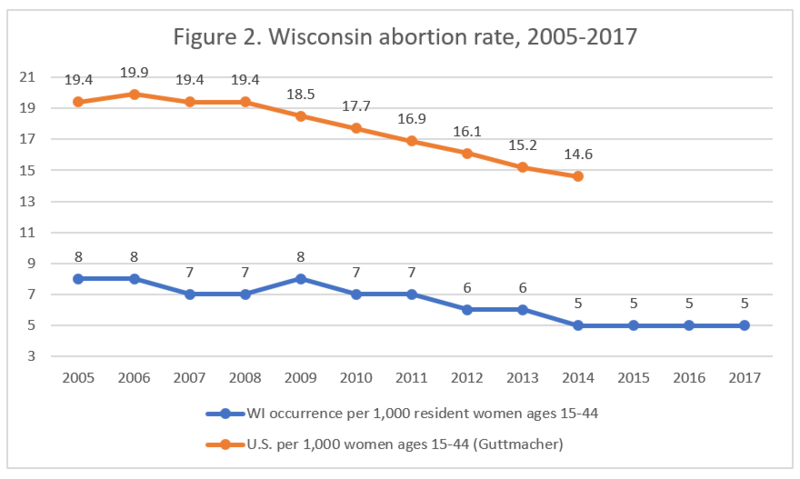 Wisconsin’s abortion rate was unchanged from the year before (Fig. 2). The vast majority of the abortions performed in Wisconsin were performed on state residents (97 percent). Fifty-nine percent of the abortions were performed on women in their twenties and 10 percent on females age 19 or younger. Twenty-eight percent were performed on women in their thirties and three percent on women age 40 or older. Just over half the women were white – 53 percent – and 28 percent were black. Four percent were Asian, and one percent were American Indian, while race was not reported for 13 percent of the abortions. Thirty-five percent of the women getting abortions had 12 years of education. Eight percent had between nine and 11 years, while less than one percent had eight or fewer years of education. By contrast, 38 percent had between 13 and 15 years of education, and 17 percent had completed 16 years or more. Educational status was unknown for two percent of the women undergoing abortions. Eighty-five percent of the women were unmarried, and 14 percent were married. More than half of the abortions, 54 percent, were performed at eight weeks of gestation or earlier. Nineteen percent were performed between nine and 10 weeks of gestation and 10 percent between 11 and 12 weeks. Eight percent of the abortions occurred between 13 and 15 weeks, while seven percent were performed between 16 and 20 weeks of gestation. Fifty-three abortions (almost one percent of the total) were performed after 20 weeks of gestation, or more than five months of pregnancy. Many abortions resulted in complications.1 There were two hemorrhages, one infection, two uterine perforations, and 45 cases of retained products in 2017, as well as 388 other, unspecified complications. Multiple complications could be reported for each abortion. According to Wisconsin’s abortion report, information on complications caused by abortions in Wisconsin is reported on forms submitted by abortion providers. Most providers fill out the form at the time of the abortion, but others fill the form out later using medical records. Information on Wisconsin’s parental consent process is provided for resident minors only. In 2017, a total of 189 resident girls under the age of 18 sought abortions. Four of the girls were emancipated minors who did not require parental consent. Nine obtained judicial waivers exempting them from the parental consent requirements, and 176 had consent provided by their parents, guardians, foster parents, or adult family members. Planned Parenthood has filed a lawsuit against Wisconsin seeking to overturn state laws that restrict who may perform abortions. Currently, state law limits abortion provision to licensed physicians and prohibits the administration of abortion-inducing drugs via telemedicine. Planed Parenthood is challenging those restrictions, arguing that they are medically unnecessary. However, a study of abortion in Finland found that as many as six percent of chemical abortions fail and must be completed surgically, which would mean that women living at a distance from qualified providers could be put at risk by chemical abortion via telemedicine. Wisconsin does not report Planed Parenthood’s abortion market share, but using numbers from Planned Parenthood’s latest annual report, CLI estimates that Planned Parenthood performs around 70 percent of the abortions reported in Wisconsin. Wisconsin Right to Life cautions that Planned Parenthood’s recent expansion could increase Wisconsin abortions, with new Planned Parenthood centers opening in Milwaukee in 2017 and Sheboygan in 2018. In CLI’s 2016 report on abortion reporting across the 50 states, New York City, and the District of Columbia, Wisconsin’s reporting was ranked at 17th place. As state laws regulating chemical abortions are challenged, Wisconsin could provide residents with relevant information by including the total number of chemical abortions performed in the state, rather than those performed on residents only. Additionally, Wisconsin could include information on the facilities where abortions are performed and the specialties of the physicians performing them. Wisconsin could also collect and report information on women’s reasons for abortion and whether the state’s informed consent process was followed. Considering the sizeable number of late-term abortions reported in Wisconsin, the state could also report whether any babies were born alive during abortions.